Photo Credit: Greta Shum/SOCCOM Researchers deploy a SOCCOM float off the side of the Research Vessel Nathaniel B. Palmer. A new network of automated instruments throughout the Southern Ocean, which surrounds Antarctica, is dramatically changing how scientists view the planet’s least understood ocean. Researchers haul a SOCCOM float to the edge of the bow of the Research Vessel Nathaniel B. Palmer for deployment. With four years of data in hand, researchers recently found that the Southern Ocean absorbs far less overall carbon dioxide from the atmosphere than previously thought. The discovery is a major departure from long-standing models that predicted that the region was a major carbon "sink," and is causing scientists who study the global carbon cycle to revisit their understanding its mechanics around the Antarctic. 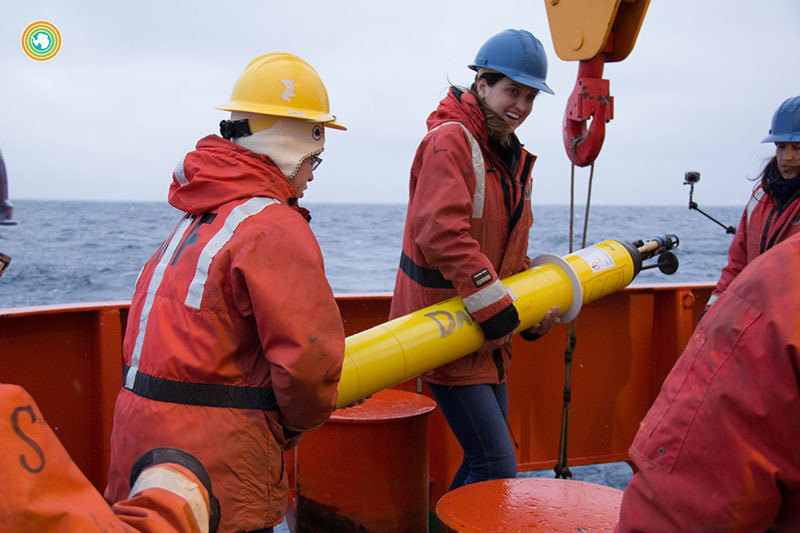 Researchers have been able to collect an unprecedented amount of data throughout the region, even during the incredibly harsh winter, with the Southern Ocean Carbon and Climate Observations and Modeling project, or SOCCOM. With it, they are already overturning longstanding notions about the planet's carbon cycle. "We found a very different answer than what our ship-based instruments would tell us," Gray said. Oceanographic data on the Southern Ocean is sparse, particularly during wintertime. The bitter cold, the 24-hour darkness, frequent storms and vast ranges of sea ice, make it too daunting for most research vessels venture into the region between the months of April and August. "It's very difficult to work there," said Jorge Sarmiento, an oceanographer at Princeton University and the principal investigator on the project. "There are huge, vast areas of the Southern Ocean that are just never sampled in the wintertime." Over the past three years, researchers have deployed more than 100 autonomous floats throughout the Southern Ocean to collect a wide range of data on it. They monitor the ocean's temperature, salinity, chlorophyll content, floating particulate matter, pH, oxygen and nitrate levels even in the dead of winter when no research vessels are in the region. "The theory is that if you develop these sensors, you can put them on robotic platforms and leave the sensors behind and they will do the work while we sit home in front of a nice warm fire," said Ken Johnson, a senior scientist at the Monterey Bay Aquarium Research Institute. According to the SOCCOM website, more than 70 papers have already been published using data collected by the floats, which first started transmitting in 2014. 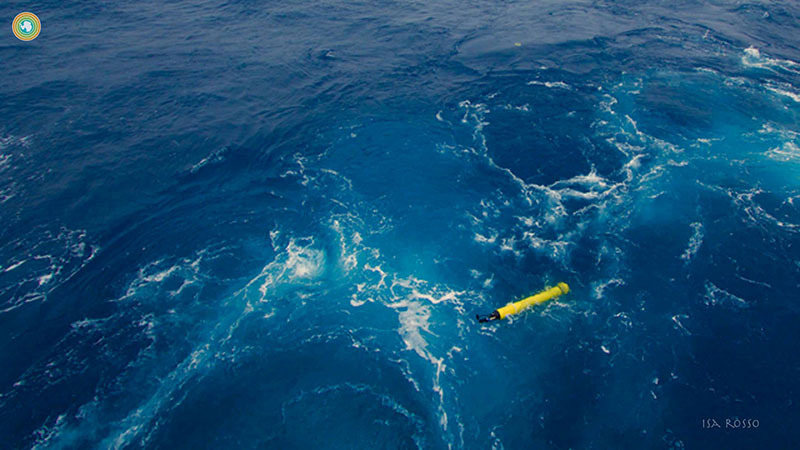 Each SOCCOM float is designed to drift in the ocean and collect data for five years. One paper in particular has been raising eyebrows amongst oceanographers. Writing in the August 14 issue of Geophysical Research Letters, Alison Gray of the University of Washington, Seattle found using SOCCOM data that the Southern Ocean doesn't absorb nearly as much total carbon dioxide as was once thought. "The Southern Ocean plays this really important role in the global carbon system," Gray said. "It is a place where the ocean and the atmosphere exchange a lot of carbon." Cold water is more efficient at absorbing atmospheric gasses including carbon dioxide. Because of this, researchers had long assumed that vast amounts of the carbon dioxide in the air, including significant amounts of the human-produced greenhouse gas, was absorbed by the cold Southern Ocean. However, now that actual winter measurements can be taken, a different picture has begun to emerge. "Previous estimates said that this whole Southern Ocean absorbs about one petagram [1 trillion kilograms] of carbon per year," Gray said. "In our estimate we reduced that quite a bit. Because of the large outgassing that we saw, it reduced the total Southern Ocean sink from one petagram of carbon to being about point one, so it reduced it to about a tenth." In addition to the ocean absorbing large amounts of carbon dioxide, the floats found one region of the Southern Ocean surrounding the continent also expels large amounts of carbon dioxide during the winter, something that had never been detected before. Floats detected that the waters just north of Antarctica's maximum sea-ice extent release nearly as much carbon dioxide in the winter as was absorbed during the summer. "It's a pretty small region but it had much much stronger outgassing of carbon dioxide than we were previously estimating," Gray said. "Particularly this was happening in the wintertime, when we had very sparse data previous to this project." That's a major change in the understanding of the dynamics of the global carbon cycle, the consequences of which researchers are still grappling with. 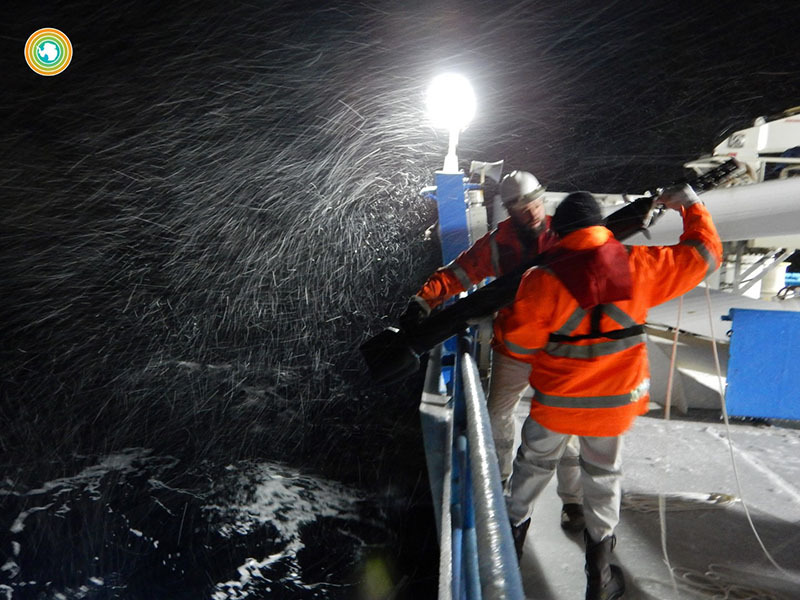 Bad weather, deep cold and rough seas make it very difficult for research vessels to operate in the Southern Ocean during the winter. "In terms of how this changes the role of the Southern Ocean in the global carbon cycle is a really great question and something that we’re continuing to work on," Gray said. "We're really trying to nail that down a little bit more, and sort of look at the implications for how does this change our carbon budget." Understanding the flow of carbon dioxide is critical because it's the greenhouse gas that has been most responsible global climate change. It traps the sun's heat like a blanket against the Earth, and its buildup in the atmosphere over the last century has led to a warming planet. Also, the buildup of atmospheric carbon dioxide itself can have a range of adverse effects on ocean wildlife. "The Southern Ocean looks like it's going to be like the first place to have really large-scale impact of acidification on the ocean, and the consequences of this is going to be a very difficult time for calcifying organisms," said Sarmiento. Tracking this global carbon system, where the sources of the gas are and what regions remove it, lets scientists better understand how much is ultimately ending up in the atmosphere and the oceans. 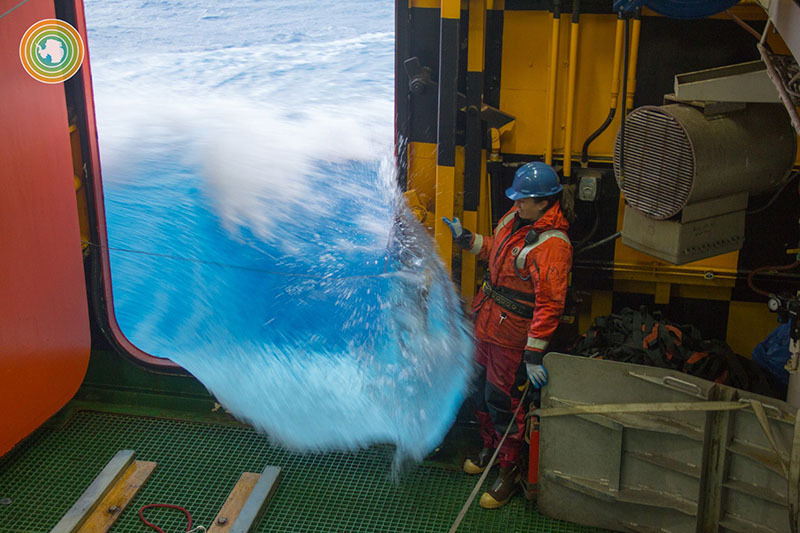 The scientists think that the carbon that's being released from the Southern Ocean is likely old, natural biological carbon originating from high concentrations that wind up sequestered for long times in the deep ocean. Microorganisms that live near the surface feed and live off the sun's energy. When they die, their remains fall and mix in with the cold deep ocean waters. However deep ocean waters don't stay at the bottom of the ocean forever. Enormous, slow moving currents transport that water around the world over hundreds of years, and much of it eventually reemerges at the surface in the Southern Ocean. "The southern end of [the Southern Ocean] is where this high carbon water comes all the way to the surface, all the way around Antarctica," said Lynne Talley, a professor at Scripps Institute of Oceanography. "When it comes up it's got high carbon and it sees the atmosphere and so it outgasses carbon into the atmosphere." SOCCOM floats are only released on southern ocean cruises that are actively taking water samples of the ocean to "ground-truth" the data the floats are capturing. At the same time some carbon dioxide, including fossil fuel-produced carbon dioxide, gets absorbed from the atmosphere as well. These recent data indicate that the overall balance is about neutral, rather than more being absorbed into the ocean, as was previously believed. "The real question on that is, 'Is this something that’s just recent?' Has climate shift caused the Southern Ocean to stop sucking up CO2, or was it just something that, because we just never went in the winter, we just missed," Johnson said. "That is the question that everybody is asking right now." 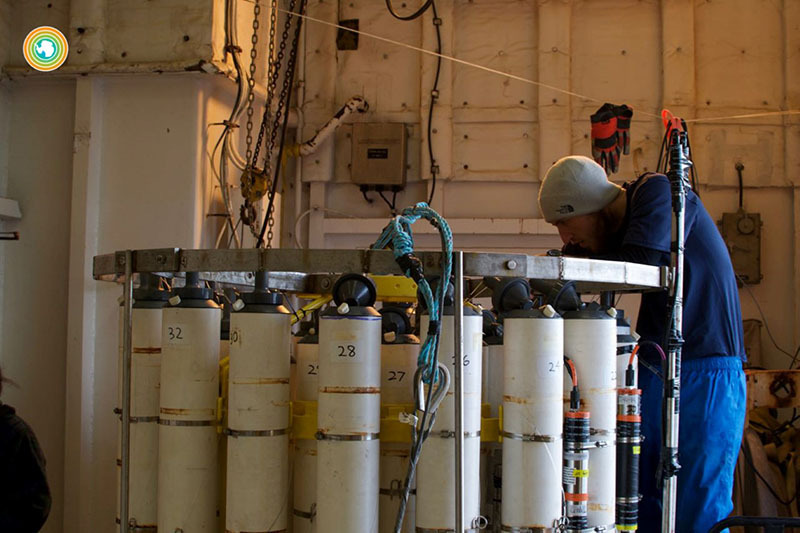 The automated floats that let the researchers capture this data built on an existing design developed by the Argo program, an international effort that's deployed nearly four thousand floats throughout the oceans of the world since 2000. 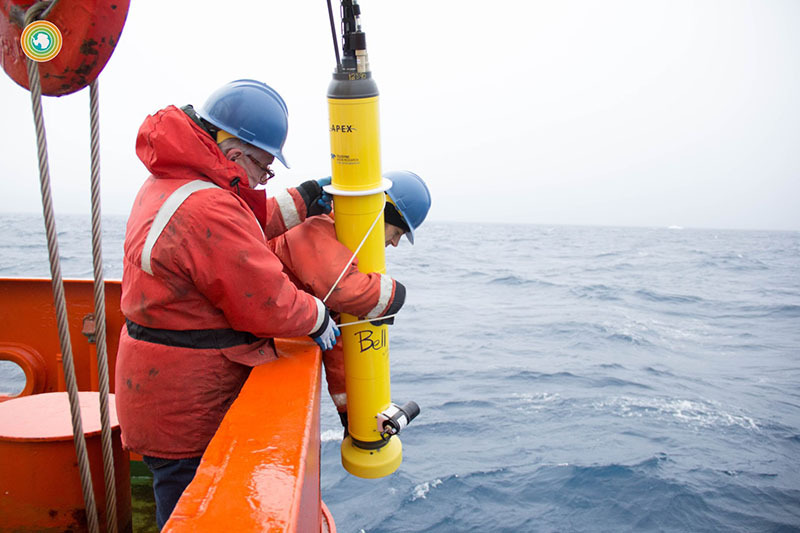 Argo collects data on the temperature and salinity of the ocean. SOCCOM uses the same float design as Argo, but carries additional sensors on board. It measures a number of chemical signatures related to the biology of the ocean as well, including its chlorophyll content, floating particulate matter, pH, oxygen and nitrate levels. "They're the most important chemicals that are associated with biological [processes]," Sarmiento said. The devices float in the open ocean for years, collecting data as they move up and down through the water column. Every ten days the floats compress their flotation bladders, and sink down to a depth of two kilometers. They then readjust their buoyancy and float up to the surface, sampling the surrounding ocean along its way. When they reach the surface, they establish contact with the Iridium communication satellite network and upload their data. The onboard thermometer helps prevent the float from colliding with ice at the surface. If it detects the surrounding water is getting closer to freezing as it rises, it means there's likely ice above. In response, the float will stop its ascent and wait days or weeks or even months before surfacing. They have enough memory to hold about two years' worth of data so they can stay below as the top layer of the ocean freezes for several months in the winter, all the while continuing to collect data that’s never been captured before. Even during the summer season, the waters of the Southern Ocean can be treacherous. The team is in their fifth year of a six-year grant to deploy 200 floats throughout the Southern Ocean, having already deployed more than 100. In addition to releasing the floats from the U.S. Antarctic Program's own two research vessels, the effort to deploy them as widely as possible has brought in multiple international partners. The team has gotten polar research teams on science cruises from around the world to deploy SOCCOM floats throughout the Southern Ocean. "We work on a lot of different countries’ ships," Talley said. "We go only on cruises where they’re making actual shipboard measurements... We collect water samples that match what we're measuring on the float." Looking ahead, Johnson hopes that SOCCOM can serve as a model for future efforts to understand the oceans all over the planet. "The Southern Ocean is really the least sampled area of the world's oceans but the rest of the world ocean really isn't that much better-sampled either. Nobody wants to go in the North Atlantic in the winter," he said. "We would like to be able to provide the community, and that's everybody from regulators to agency people to the science community, the fundamental data on the functioning of the system. Is it charging along as it should or is it changing?" NSF-funded research in this story: Jorge Sarmiento, Princeton University, Award No. 1425989.